Everything has become so politicized in our culture now that if the same episode aired, there'd be loud screams of, "Yeah! Sticking it to Trump!" from half the internet, and "What is this SJW agenda bullcrap ruining my Trek!?!?" from the other half. I'm just kind of sick of the whole thing. If somebody could set off an EMP and destroy social media, I think we'd all live happier and more productive lives. Sounds about right. The extremes have ruined everything. The politicization of pop-entertainment has ruined one franchise after another. I’ve read about DISCOVERY’s subsequent episodes, and I just have no interest. Bad writing, bad science, retcons galore. And the producers hide behind their progressive ideology, although I don’t think they’ve gone quite as far with the “racist”/“sexist”/“manbabies” stuff as Lucasfilm has. These things are no longer about storytelling. It’s a culture war, in which people who are not particularly creative have taken existing IPs and use them to preach. From what I’ve seen, fans’ and reviewers’ descriptions of DISCOVERY characters seem to boil down more to their surface characteristics more than their actual personalities and such (“Gay Doctor”, “Robot Head”, etc.). Doesn’t fill me with confidence about the quality of writing and characterization. I’m generalizing, of course, but that’s the vibe I get. The filmmakers cry “bigot” when legitimate criticisms of story and characters are raised by fans, and some fans go overboard in condemning and harassing filmmakers because they see agendas everywhere. The reality is probably closer to the middle. Some fans feel entitled to dictate where and how a franchise should go (they’re not), and some filmmakers feel like they can do whatever the heck they want with a property once they get the keys (Which is just bad business. Know your audience! Unhappy customers will stop paying!). Vintage STAR TREK could be preachy, yes, but it was used to generate conversation, not tell people what and how to think. It was about getting people TO think. From what I’ve seen of DISCOVERY, I’ve not been impressed by its morality or intellectual content. I identify as neither Republican nor Democrat. I tend to be moderate, and just try and treat all people I meet fairly and compassionately unless I’m given good reason not to. I don’t have a dog in this culture war. The extremes on both sides greatly worry me. But, that all said, my Spider-sense has often tingled when seeing these brave, new iterations of beloved franchises. Too often, the people behind the scenes open their mouths and say things which have made me call into question their motives. Too often do they seem more concerned with patting themselves on the back for their progressive ideology rather than telling compelling stories and characters which resonate with the audience. And too often have they reacted badly to legitimate criticisms of stories and characters by hiding behind words like “bigot” and “alt-Right Nazi”. It’s all very tiresome and sad. Social media is a blight, of course. My fascination with the creative process aside, I much prefer the days when art was just thrown out there in a vacuum, to be analyzed by the audience with little or no commentary from the creators. And, politics, aside, I simply have no interest in the show on a canon/storytelling level. I don’t have any interest in Spock’s until-now-unseen Mary-Sue sister, or any of the other weird and off-putting stuff I’ve read about. Spore-drives, f-bombs, and nostalgia-milking references to TOS simply hold no interest for me. It’s just the usual exploitation of familiar names and ideas to keep the fans interested. Which is why I’ve voted with my wallet, and don’t waste time and energy yelling at people online about it, aside from the occasional discussion here. And even that gets me all riled up and uneasy, which is not what I want. I managed to survive my rewatch of ENTERPRISE without having a stroke from all of the continuity-havoc that show wreaked on TOS. I think I’d be best-served ignoring whatever TOS-exploiting surprises DISCOVERY has in store. Better ways to spend my time and energy. I’m not one of those people who will digest anything with the STAR TREK name on it because of mindless brand loyalty, or because my self-esteem is intrinsically tied together with what other people think of a franchise I’ve loved for my entire life. Because I love these things, I’m willing to let them go. I just regret the inevitable tarnishing of their legacies. Fact of the matter is, I see properties I love dying all around me, and even discussing their problems is becoming...well...problematic, because all of the politics and whatnot end up getting dragged in. It’s no longer about storytelling and generating a spirit of fan community. It’s about politicization and taking sides, rather than finding common ground. Whatever happened to the good old days of fans arguing simply because Spock uncharacteristicslly and casually told Droxine about Pon Farr...? If Star Trek had first come out today, I'm convinced Roddenberry would be dismissed as an SJW. Alexander: Was there some pressure on you from the network to make Star Trek “white people in space”? Roddenberry: Yes, there was, but not terrible pressure. Comments like, “C’mon, you’re certainly not going to have blacks and whites working together “. That sort of thing. I said that if we don’t have blacks and whites working together by the time our civilization catches up to the time frame the series were set in, there won’t be any people. I guess my argument was so sensible it stopped even the zealots. In the first show, my wife, Majel Barrett, was cast as the second-in-command of the Enterprise. The network killed that. The network brass of the time could not handle a woman being second-in-command of a spaceship. In those days, it was such a monstrous thought to so many people, I realized that I had to get rid of her character or else I wouldn’t get my series on the air. In the years since I have concentrated on reality and equality and we’ve managed to get that message out. I would rather good stories be told with interesting characters I care about, regardless of their diversity. By all means have a diverse cast -- it wouldn't be STAR TREK if otherwise. However, the diversity in DISCOVERY is an artificial product of a writer's room committee more interested in ticking all the right boxes than telling anything resembling a story worthy of the name STAR TREK. It's just relationship drama with phasers and space ships and unrecognizable Klingons. Soap opera schlock with the surface trappings of Sci-fi, all bloated and decompressed so nothing really happens or progresses narrative-wise. But it's all excusable as long as everyone is represented so no one feels left out or left behind. The social media ramblings of the actors and crew involved kind of sickens me and leaves the impression they don't think their work stands well enough on it's own merits -- and that they don't trust the intelligence of their audience. STAR TREK is poised to burn itself out. Again. Harder and faster than it did fifteen years ago. That's what saddens me. I pine for a STAR TREK that is both entertaining and challenges my perceptions of the world. A STAR TREK that makes me think. The current incarnation is none of these things. That’s hysterical. I wonder how that show would have turned out if social media/general cultural stress levels were as riled up as they are today? This is interesting but I am not sure I understand what you mean (ironically I haven’t seen any social media from the actors and crew and I guess you haven’t seen the show, or the whole series). I can only give you a sample size of five people who loved this show. My best friend and Star Trek buddy from 7th grade onward who owned the concordance and technical manual and went with me to conventions when we were both too young to be doing that by ourselves. My dad who was born in 1938 and who started me on Star Trek when I was a baby. My other best friend since 9th grade whose nickname is Scotty and whose mom just baked him a birthday cake in the shape of a shuttlecraft for his birthday. My good friend from college who is a life-long fan. And me, whose first spoken phrase was “where no man’s gone before” (thanks to the aforementioned dad!). Two of these people held their noses and voted for Trump (with one of them being slightly to the right of the WSJ editorial page), three of them held their noses and voted for Hillary. We all loved Discovery and found it fun, entertaining and thought provoking. None of us liked it until episode 3. Probably the only other thing we all have in common is that we don’t do social media (unless me doing this somehow counts). Maybe that means something, I don’t know. But I thought I would throw it out there. ...and I guess you haven’t seen the show, or the whole series. Why would you guess that? 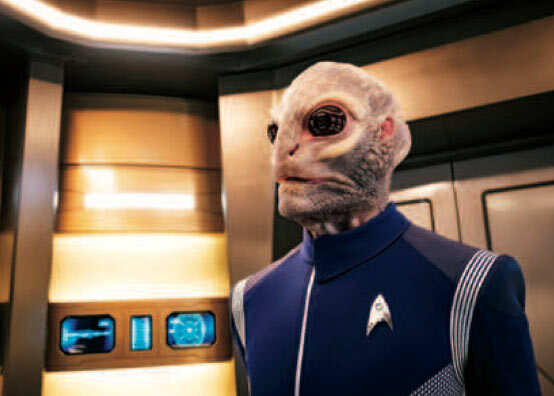 So, we're getting a Saurian this season. Season Two Trailer. Looks like we’ll be seeing our fair share of Pike. Its also just been announced that Rebecca Romijn will be playing Number One. The turbolift scene in the trailer could have been lifted from The Orville. It's just relationship drama with phasers and space ships and unrecognizable Klingons. Soap opera schlock with the surface trappings of Sci-fi, all bloated and decompressed so nothing really happens or progresses narrative-wise. Curious to hear what you think happened in TOS narrative-wise that progressed more than that which we saw in the first season of Discovery. When the first season of TOS ended, was the status quo substantially different to the beginning? And if not, was that a bad or a good thing? Discovery was far from perfect, but I do not feel that it's flaws came in the form of zero narrative progression. We ended in a substantially different place than where we began. So, it seems they're trying to answer one of the big criticisms of season 1: The Klingons. The head of makeup design at Star Trek Las Vegas said a couple of things. First he said that the different Klingon houses originated on different planets, because the Klingon Empire is an empire, and so there are genetic differences, and they'll look different. There were only six houses depicted in season 1, and those six all had differences if you look closely. Apparently in Season 2, they are going to introduce more Klingons from other houses, and they are going to look different. So presumably, we could come to a point where we see TNG and TOS Klingons in the mix. Also, he said that the Klingons in season 1 were not supposed to be hairless. Since they were supposed to be part of a Klingon Kahless cult, they shaved their heads in a ritual based on Kahless having crafted the first Bat'leth from his own hair. By the end of the last season, I was at the point where my only real beef with the show was the art design. If what's in the trailer and this from the convention are true, then they may be making an effort to fix that. That is such a simple explanation for Klingons looking different. I can't believe it took this long. Gen, and none of the others! There actually weren't that many episodes of TOS that featured Klingons, and the origin of those Klingons was already explained by ENT. There are several ways to explain the TNG status quo. Certain houses rising to prominence a century and a half later, for example, so that the Klingon military, which is most of what we saw, comes to be dominated by members of those houses. Or, since what's taking place in the Discovery timeline is the unification of the various houses of the Empire, maybe there will be an increase in inter-breeding in a more united empire so that a lot of those genetic differences becomes less pronounced. 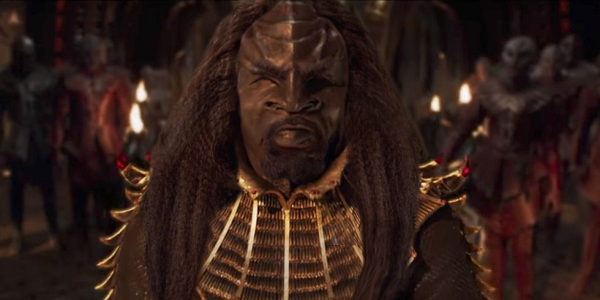 I also found the fan art below fascinating, where someone took a Disco Klingon and put the traditional hair on him. "Yay, we got the rights to use real Klingons back from Paramount"
"Yeah, we f***ed that one up bad. Sorry." That fan art looks more like t! The "different houses" idea should have served as the explanation all along. It would be easier if they came out and said "We can get someone who sorta resembles Leonard if the room lights were dimmed but there's no way we can get the calibre of acting required to pull off a decent Spock on a TV budget so we're going to patch the wall of continuity with peanut butter instead of plaster. Also, Zach isn't interested. We really, really, desperately need to be associated with real STAR TREK for ratings and money or we won't get a third season." Tim, I've long maintained that no explanation for the differences between the Original Series Klingons and Movie-Era ones was necessary. Isn't it an Empire these people belong to? Doesn't that encompass multiple planets and many different species? I can see Klingon culture becoming the central one on many worlds, and the people of these planets seeing themselves as no less Klingon over time as the Klingons of other worlds. What required explanation was where the Original Series Klingons went once the new ones showed up. 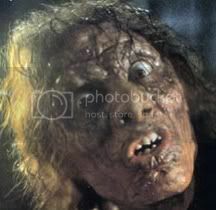 The answer, of course, was that we were just supposed to accept that Klingons always looked like the new ones. That's how it was approached on DS9 when they brought back the characters of Kor, Koloth, and Kang. It didn't play, but it's still better than the mutated Khan-virus explanation that was foisted upon us eventually. Similarly, I wish they'd stop canonizing every little jot and tittle of Spock's uneven development as a character. We are apparently going to get the grinning, barking, brusque, and borderline insubordinate Spock from the pilot, served up anew as a genuine stage of Spock's life. Clearly, we can never just let something alone. Profit motive demands that we delve, and delve further, and further still into what was simply an organic creative process. It's one more reason to regret the producers' decision to shoehorn Discovery into this awkward place in the Trek timeline. Was anything that was good about season one good because it took place at this point in the franchise's history? Or would the story have worked just as well following Picard's tenure as Captain? Wouldn't the "spore drive" have made more sense as new technology rather than as something invented and then forgotten before Kirk showed up onscreen? As it stands, we're now going to be given yet another "Young Spock," this one with grins and smiles a-plenty. Gosh, I hope we get another label for this one so we can keep him straight from "Spock-Prime" and "NuSpock." "DiscoSpock," perhaps? Star Trek is fast becoming the CW's "Flash." Can't wait for "MirrorSpock" to return/debut as the BigBad of some future season. Heh, now I can't stop thinking Spock dressed as John Travolta in Saturday Night Fever, dancing like him but with a deadpan look on his face. Brian, I totally agree with you. whatever the quality of the acting or writing, I could accept the premise of Discovery a lot more if it hadn't been set in the time period it is. I see no reason not to move on 50 years from TNG/VOY and set the series there. That way it would explain the the technological differences, the changes in uniform etc., and in fact would hamstring the producers less as prequels often do. The Genesis Effect on me...! Rumors are going (rumors, not facts) that Discovery may become as yet a prequel to the Kelvinverse movies, and that the planned Picard series is also set in the Kelvin verse. There is the story going around that CBS is planning now to completely reboot the Star Trek franchise; basically everything before the 2009 movies such as the Original Series, TNG, DSN, VGR, ENT, will no longer be referred to and that timeline will not be used again. Some people have already reacted that Star Trek died in 2009 with the first Kelvinverse movie, but if this is true and there will nothing be done with the original timeline any more including merchandise (I think it is save to say that books will continue) such as comics, toys, games etc; that this will probably be the final death knell for many fans. I doubt that a lot of fans will be happy with this plan CBS has to get rid of the "Prime" timeline though I doubt that they will stop streaming the old series.